Hutdesking, updesking and blue sky thinking. So nearly corporate, but not quite. And so very not corporate when in the context of Guardswell, a farm with a difference on a hilltop between Perth and Dundee. Last week, the JCM team hut-desked – taking our work to a hut on a hill (made out of a fishing boat) with a view that should be tried for serious distraction; we went digital in a bull pen; we had meetings negotiating a sheep path (rather than a cantankerous overhead projector), and we struck on big ideas under huge expanses of blue sky. We basically transferred our office routine to an entirely new environment. In the rapid response, instantaneous lives we lead, our noses are often pressed so close to the screen that we don’t see the wide angle, and actually doing something you do every day differently can change the whole perspective. So we tried it out and took our office to Guardswell for three days. Recently renovated with love by the Lamotte family, Guardswell is whatever space you want it to be. With a stunning cow shed conversion, Scandi-style huts for two, all sheepskin rugs and wood-burning stove, and a bright, traditional farmhouse, it hosts weddings, provides peace and digital detox to burnt-out corporates and romantic weekenders, and its latest venture is #wildthinking. This concept is lent to teams or groups looking to get away from the restraints of offices and conference rooms, to spend proper time with their team and to bring out the best in them in a different and very relaxed series of spaces. It’s not any crazy team building activities (though it could be), but it may include a facilitator to bring on the big ideas or develop skills, leadership or emotional intelligence, or just be team time, or a meeting in a different, open and inspiring space. So far from corporate speak, but, for those that embrace doing things a little differently, all the more effective for it. Leaving the normal routines behind and plunging ourselves into diverse and open spaces allowed for free-range, reality-based thinking without the usual distractions. Research compounds what we all know, that fresh air, a sense of space and exercise boost our moods and our creative thinking. Facebook’s Mark Zuckerberg is renowned for his walking meetings and look where he has got to, so we walked and talked through ideas as we explored the farm and enjoyed the views. The colours blue and green are also associated with greater creativity, so this environment couldn’t have been more perfect with its fields, river and open skies for expanding our horizons on many levels. Combined with the clever touches, from flowers to cosy corners, choreographed by Anna Lamotte, the artistic energy behind Guardswell. You can also take advantage of the bike and running-friendly roads around Guardswell to find your own space to allow the mind to wander and reach the ideas buried in the subconscious, sometimes so hard to grip. In these times of austerity, away days are often now frowned upon, but it doesn’t have to be fancy or expensive to draw out the best in your team. It just needs the right space. Susannah Pate is a PR professional, living and working on the family farm, with a background in food, tourism, rural and agricultural PR. 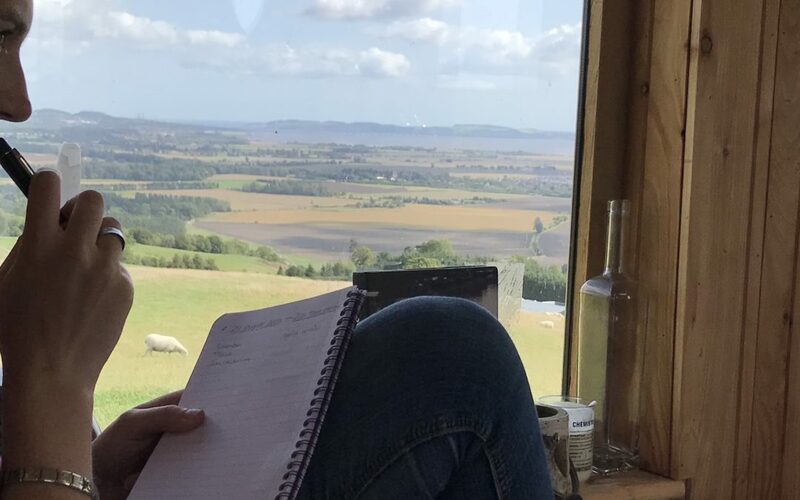 Susannah is a graduate of the Scottish Enterprise Rural Leadership Programme, and an Oxford Farming Conference Emerging Leader.